Did you know that San Valentino was Italian? The patron saint of love lived in Roma for most of his life. To us, this proves that we Italians know what we’re doing when it comes to l’amore. In celebration of Valentine's Day, we have curated The Ultimate Dolci, a special gift box filled with the finest Italian sweets. From artisanal candies to luxurious chocolate dragees, will sweeten your own amore’s day. 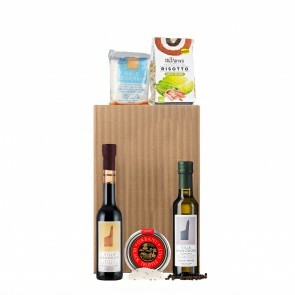 This gift box includes Classic Chocolate Wafers by Loacker, Pan di Stelle Cocoa Cookies by Mulino Bianco, Pistachio Dragees by Giraudi, Linden Blossom Honey by Mieli Thun, Festivo Portofino Citrus Soda by Niasca Portofino, Fig Jam by Dalpian, Eataly Mixed Candies by Leone, Coconut Dragees by Domori, and a signature Eataly gift box.